The Lookup function was introduced in ActiveReports 11 to strengthen the support for multiple data sources/datasets in a data region. Continuing with this, ActiveReports 12 introduces the concept of DataSet Joins, which gives further flexibility to retrieve data stored in different data systems/data sources. In this blog, we'll look at what a dataset join is, how to use dataset joins, and understand their benefits with the help of a business scenario in ActiveReports. Conceptually, "Dataset Joins" can be compared to SQL joins with a crucial difference: writing complex SQL join queries is not involved in this, and dataset joins can be used with any data source – file-based like XML, JSON, CSV etc., or even relational databases like SQL or Oracle. When the data is stored in multiple data sources including file-based sources – CSV, JSON, XML etc. When the data has 1:N cardinality. For data with 1:1 cardinality, Lookup function is more suitable to use. While "Lookup" returns only the first occurrence of the record from the related dataset, "Dataset Joins" fetches all related records like "Left Outer SQL Join". To retrieve the data from multiple data systems in reports designed using ActiveReports, you need to have datasets based on different data sources and nest data regions such as Table, Tablix, List, BandedList, Chart, Bullet, Sparkline within Page, and RDL reports. Thereafter, an internal mapping (termed as DataSet joins) needs to be created between these data regions bound to these datasets. The data to be shown in this report comes from different data sources. Employee details are maintained by HR department in an online system and the data is generated/available in JSON format for use. Payroll details are maintained by the finance department and stored in a SQL server database. Note: For the scope of this blog, we will not be going into the details of report design (appearance part) but will be primarily focused on the data retrieval aspect. For more information on designing reports using ActiveReports, you might want to refer to "Single Layout Reports" walkthrough. Bind the List to EmployeeInfo dataset and Table to EmployeePayroll dataset, then group the List on EmployeeID field to categorize the payroll information of an employee on single page of the report. Now that the data regions are bound to datasets, they're acting independently and a mapping - a join - is required between them so we can display the data from different data sources. To display the payroll data for the respective employee, we need to define this mapping between Table and the List data regions. There can be two ways to create this mapping in ActiveReports 12 - by specifying filters or parameters on the child table. 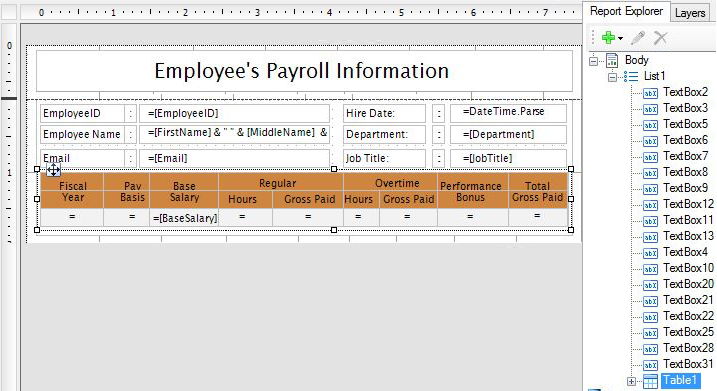 Here, EmployeeID in Expression is evaluated in context of the EmployeePayroll dataset and EmployeeID in Value is evaluated in context of the EmployeeInfo dataset, thus retrieving the payroll records of employees to be displayed in the child table whose employee ID matches the employee ID displayed in the parent list. 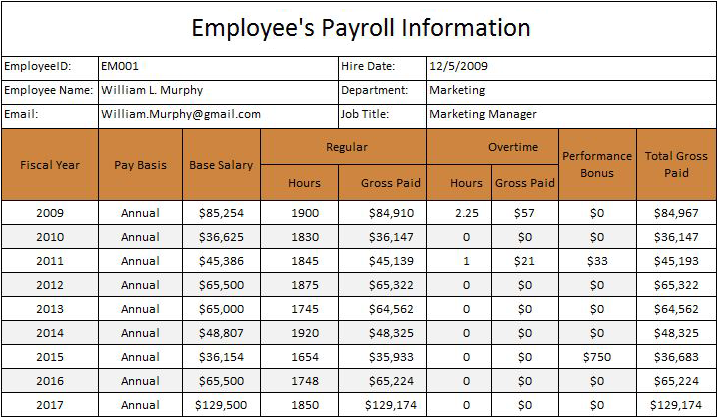 Here, the parameter empID added in the DataSetParameter collection of the child table is evaluated in context of the EmployeePayroll dataset, and the value is evaluated in the context of the "EmployeeInfo" dataset, thus retrieving the payroll information of respective employees to be displayed in the child table. 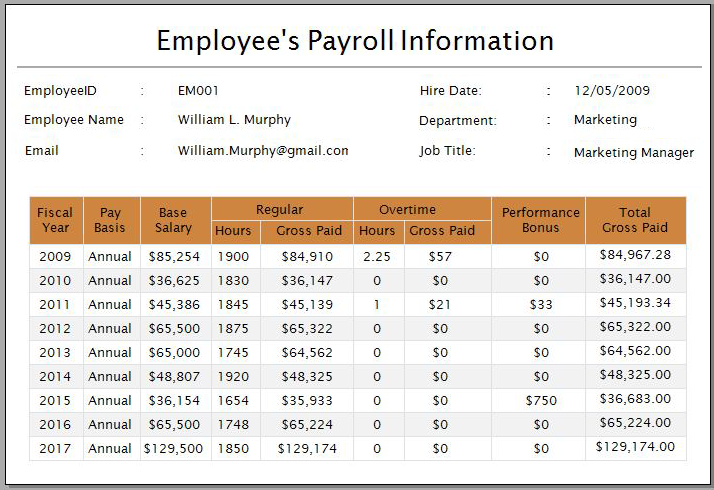 Once the required mapping has been done using either of the above approaches, here's how the report looks with the payroll information for respective employee over the years. You can download the complete reports here. While the parameters approach is good for showing larger records in the child table, the filters approach is more suitable for displaying limited records in the child table and can be used when child datasets does not support parameters - CSV, XML, JSON and other non-SQL data providers. Although parameters are slow to process, they consume less memory, whereas filters are fast to process but consume high memory when working with the dataset joins. So, depending upon how your data is organized and your business needs, you may choose either of the above approaches for retrieving data from different datasets in the nested data regions. For more information on dataset joins, see topic "Nested data regions bound to different datasets" in the help document. As a software engineer, Paarisha enjoys GrapeCity's environment of encouragement and learning. She enjoys reading, aerobics, travelling, and exploring historical places. 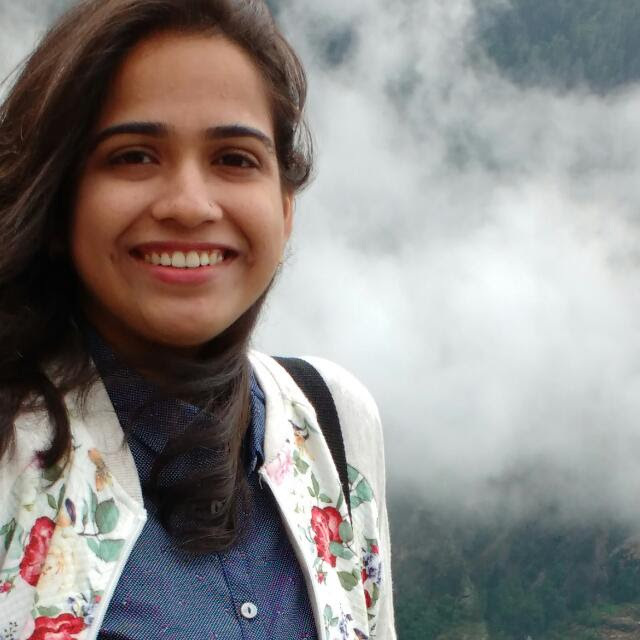 Paarisha graduated from Uttar Pradesh Technical University (UPTU) at Lucknow (India) with a Bachelor's of Technology in Information Technology, and you can find her on LinkedIn.